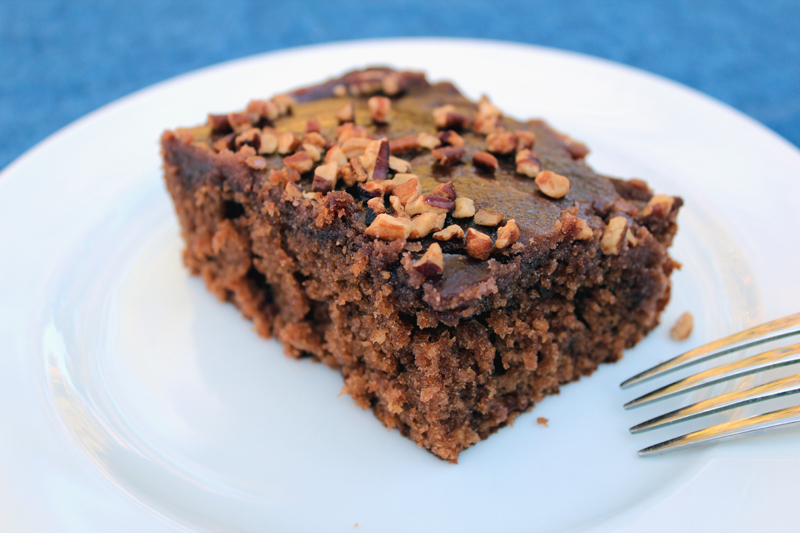 Happiness Project Recipe #20: Southern Mama Chocolate Coca-Cola Cake! Coca-Cola in cake?? Yes, please! Why though have I never before indulged in this sweetened, chocolaty delight?? Perhaps, because before now, I had never heard of such a lovely cake! So for the 1st time since recovering from my surgery (and after being horribly sick for the past 2 & a half weeks), I finally felt well enough to be up and about in my kitchen, trying out this new recipe. Oh kitchen, how dearly I’ve missed thee! Regardless of the fact that I generally stay as far away from soda as I can (considering how truly disgusting and tragically unhealthy the drink itself is), I was very intrigued by the idea of combining coke with chocolate and was not disappointed with the end result. So here it is, my soda loving friends! Come and get your fix on! In bowl #1, combine the flour, baking soda and sugar. Blend well. In a medium saucepan, throw in the butter, marshmallows and chocolate chips. Cook over medium heat until everything is nicely melted and bubbling slightly in the pan. Remove from the heat and stir in the cocoa. Set aside and let cool slightly. Now add the Coca-Cola, buttermilk, eggs and vanilla to the dry ingredients (bowl #1), stir until just combined. Slowly add the slightly cooled butter/marshmallow/chocolate chip/cocoa mixture and mix until combined. Pour the batter into a greased or sprayed 9X13 pan and bake for 30-35 minutes until a toothpick inserted in the cakes center comes out clean. Set your cake aside to cool slightly while you’re preparing the icing. For the icing, combine the butter, Coca-Cola, cocoa and powdered sugar in another saucepan, heating on high until just boiling. Remove from the heat and stir in the vanilla. Now comes the very important part. Quickly and evenly pour the hot icing over your slightly cooled cake. The faster you pour the hot icing over the cake, the less likely it will start hardening up (a lesson I learned the hard way today). Now, if desired, sprinkle with pecans. Although this cake is best when served warm, it will still taste quite flavorful when fully cooled as well. So go grab that pack of tempting, unused soda and do something creative with it! Tis a very yummy, sweet and fun cake, if I say so! « Happiness Project Recipe #19: “Love, Baby” Vanilla Sprinkle Donuts!